Although people photography is how I make my living, nature photography is my escape from all the things that are involved in running a business. Yes, photography is both my profession and hobby. The image of my camera above was taken with my iPhone. 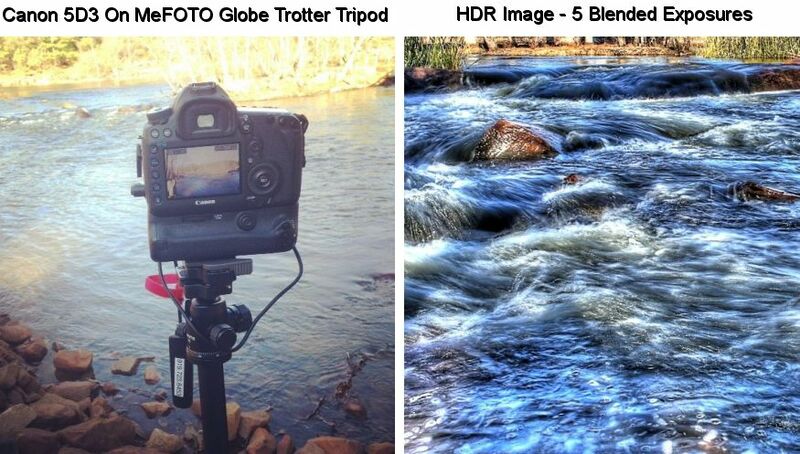 The tripod is the MeFOTO Globe Trotter which is great for on the go shooting. You'll see a trigger hanging down the side because that's how I released the shutter. Many of these shots were taken at slow shutter speeds. All of the HDR images in this post were done with five blended images: One 2 Stops Under, One 1 Stop Under, One Even, One 1 Stop Over and One 2 Stops Over. The final blending was done in Photomatix with the JPG file not the RAW file. I did shoot both JPG and RAW. Below you will find a gallery of some of the shots that I took on this brief outdoor adventure.